Home / Game of Thrones / George R.R. 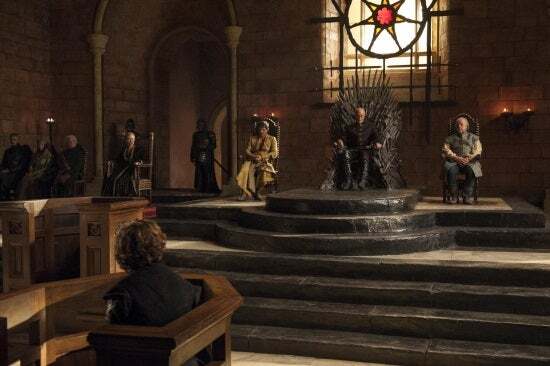 Martin / HBO / Reviews / TV / [Review] - Game Of Thrones, Season 4 Episode 6, "The Laws of Gods and Men"
[Review] - Game Of Thrones, Season 4 Episode 6, "The Laws of Gods and Men"
So, apparently, the rule of law in Westeros is "guilty until proven so." There is no expectation of defense and no opportunity to do so either. Tyrion finally sees how stacked the deck is against him, and how completely screwed he is. And instead of using his guile to get himself out of it, he stood tall, looked the lion in the frothing jaws, and bit back. And it might have been the most impressive thing the show has done in a great long while. Hit the jump for the brief review, which contains spoilers that wish they were the monster you think they are. Before I touch on the good stuff, I wanted to take a moment and voice my concern. While I'll avoid any spoilers from the books, I am growing incredibly concerned with the direction the show is taking in some quarters, in relation to the story from the novels. Some characters simply have more to do than others. Tyrion, for example. Others do not. In some cases, like Jon and Bran, the writers have developed wonderful, original stories to get them through the season, which add to, but don't distract from their established storyline. Others have not been so lucky. Others, especially those whose stories in the novels were already artificially inflated in the novels, have not been gifted with something new, and crucially, interesting to do. Instead, for a handful of characters, the writers have seen fit to simply fast forward into the next set of novels. This will cause problems later on down the line. Anyone who hasn't read the novels will be oblivious to the mounting problems that will present themselves sooner rather than later, but book readers are starting toget the jitters. Brienne's story has skipped ahead significantly. As has Theon and Yara's. But none so wildly and recklessly as Dany's. To give the non reading public an idea of my agitation, the siege of Meereen should have been drawn out over at least two episodes, though more comfortably at three. Her finally taking the city should have occurred much closer to the end of the season, along with a significant emotional arc that the writers haven't touched on at all, yet is of the utmost importance. Her current story, the rule of Meereen, expended in a handful of episodes, should have made up the bulk of her plot next season. And in the end, the reason for this necessary escalation is a direct result of the pig-headed instance that she appear in every episode. Like Tyrion a season ago, the idea that there is one character who must appear every week is detrimental to the show as a larger entity. Which has been a problem since the beginning. With so many story lines to juggle, the writers have exhibited difficulty in striking a balance. Individual scenes are marvelous, the sum is less than the parts, and occasionally smacks of impatience. What is most peculiar is how some characters are seemingly immune to this behaviour. Arya has only appeared sporadically, and sometimes I forget that Bran is still on the show. Why are the writes content leaving some characters to get about their own business, while others spin their wheels on screen week after week. The show works best when it plants its feet and focuses. Now, this usually also means that something is going to explode or someone is going to die, but occasionally it just means that some damned good storytelling is going to happen. For instance, this week, a solid half of the episode focused on the Trail of Tyrion Lannister, and it was glorious. In fact, aside from Dany's brief bit, only three plots were dealt with here. Stannis and Davos ventured to Braavos, giving us the first look at the free city and introduced us to Mark Gatiss' iron banker. Davos scenes remain my favourite, if only because Liam Cunningham seems to be having so much more fun then everyone else (that, and he's one of the few allowed to have fun in character). Then there was some stuff with Theon, mostly meant to remind us how much of a pleasure Ramsey is as a clear cut villain. But mostly, it was Tyrion, and the effects of his trail (which, again, I expected to take at least two episodes to play out). If gifted us with great scenes from Jamie and Tywin (not hard to do, admittedly), and what everyone is in agreement is an Emmy worthy scene from Dinklage. But for me the highlight was Varys. He's rarely given extended attention, but when he is, it reminds us that he might well be the most complex and interesting character on the show. His motivations are simple, but his methods are beyond investigation. He plays all sides while keeping his true intentions completely veiled. As he says, he only reveals himself to those he trusts, such as the budding relationship he had with Tyrion, but just as easily turns on a friend if it suits his end game.